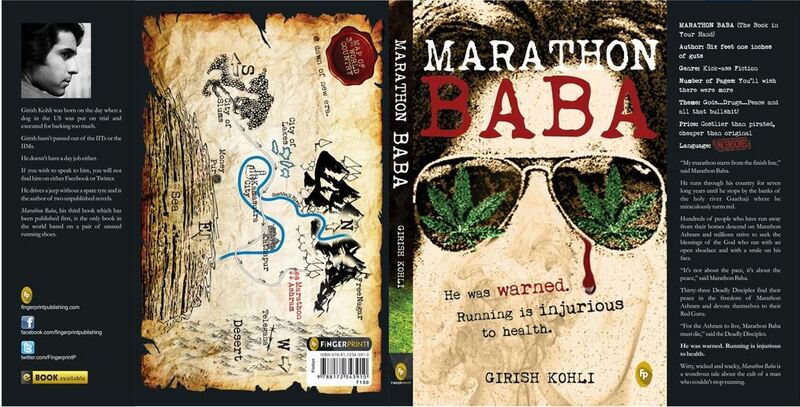 ‘Marathon Baba’ is Girish Kohli’s first novel. Or as the book puts it, it is his third book which has been published first. Along with the quirky title, what catches your attention as soon as you get hold of the book is the cover design. The colours, font sty;e as well as the map on the back cover give the book a very unique feel. Does the book work? Let’s check it out. ‘My marathon starts from the finish line’, said Marathon Baba. He runs through his country for seven long years until he miraculously turns red and builds Marathon Ashram. Hundreds of runaways descend on the Ashram and become its residents. ‘It’s not about the pace, it’s about the peace’, said Marathon Baba. Thirty – three Deadly Disciples find their peace in the freedom of the Ashram and devote themselves to the Red Guru. ‘For the Ashram to live, Marathon Baba must die’, say the Deadly Disciples. He was warned. Running is injurious to health. Witty, wacky and weedy, Marathon Baba is a wondrous tale about the cult of a man who couldn’t stop running. The book is DIFFERENT from the rest. From the cover to the style of writing to the story, everything has been experimented with. Among the 40 odd books I have reviewed on this site till date, this is probably the first one which didn’t give me the slightest idea about what exactly to expect in the story. And that’s probably the book’s biggest USP – The curiosity factor. Karna is a regular guy who has a very troubled childhood because his parents keep fighting all the time. He has a girlfriend – ‘Honey’. The day he has planned to elope with her, she gives him a call to say she cannot run with him because running is injurious to health. And since then he starts running away from everything in life, even his ‘corporate prison’ (job). The rest of the story deals with how he becomes Marathon Baba and establishes the Marathon Ashram. Girish has poked fun on the Indian system as well – Corruption among police offers, the system of begging and the craze with which the whole population runs to worship a holy man who may not even have any basis is well documented. But then his story is also lined up with absurd characters who speak in filmi style, crazy and bizarre situations and the most unique style of writing probably seen among young contemporary Indian writers. In Girish’s world; the moon romances the river, the river stretches and works out, the sun labours like an old patriarch and the lift opens its arms to a fleeing Karna. Every living or non – living thing is a character in the story. Reading the way he describes each and everything is an experience in itself. But the book isn’t without its share of flaws. Though the style of writing is unique, it can surely get irritating for a lot many readers who are not accustomed to read such stuff. The periodical comments by the author in between the story, trying to make things more believable seem pretty much out of place. It hinders the flow to a point. The entertainment is also mostly left only to the dialogues. Once the story reaches the Ashram, things become relatively dull. The antagonist and his reasons for behaving as such are nothing to write home about. But all said and done, the writer deserves kudos for attempting such a unique book in the first place. It also takes guts for a new publishing house like ‘Fingerprint’ to take up the cudgels to begin their careers as well with such a book!